We are just back from a week at ground zero in the FPB world. 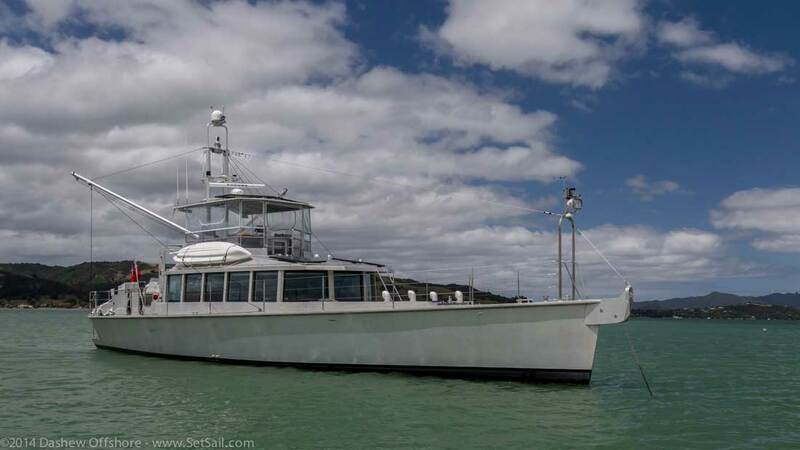 We had the chance to take a couple of boat rides, hang out with three owners who are presently moored in the town basin, and review hundreds of details with the Circa team. Long, hard, but gratifying days. In particular seeing one of the sheds with a FPB 64, the beginnings of the first two FPB 78s, and a 97 gave your correspondent a buzz. 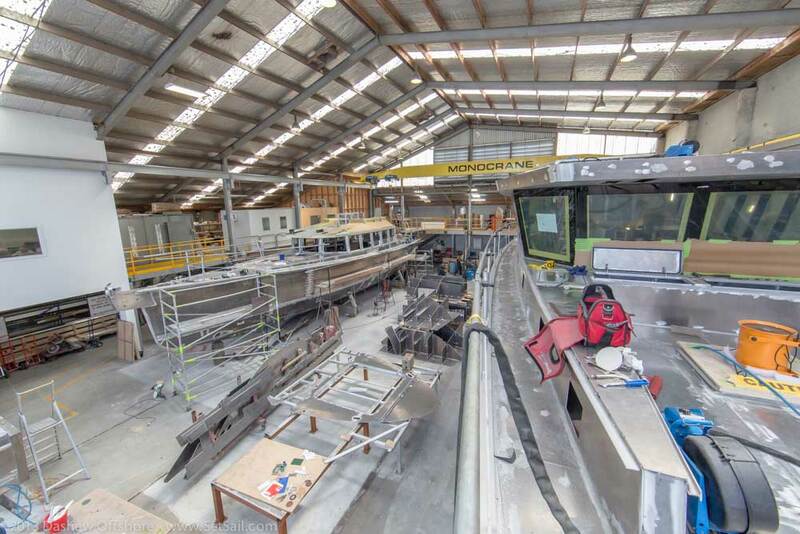 This is not an easy game to play, and the past year has been intense, with the design cycle of getting the FPB 78 series up and running, and the usual work load of attending to the needs of fourteen owners. Yet we and the Circa team are in good spirits, as you can partially see above. It is always nice to see the vision that is generated in the computer between our ears, and on the desk, take shape. This is the beginnings of FPB 78-1. 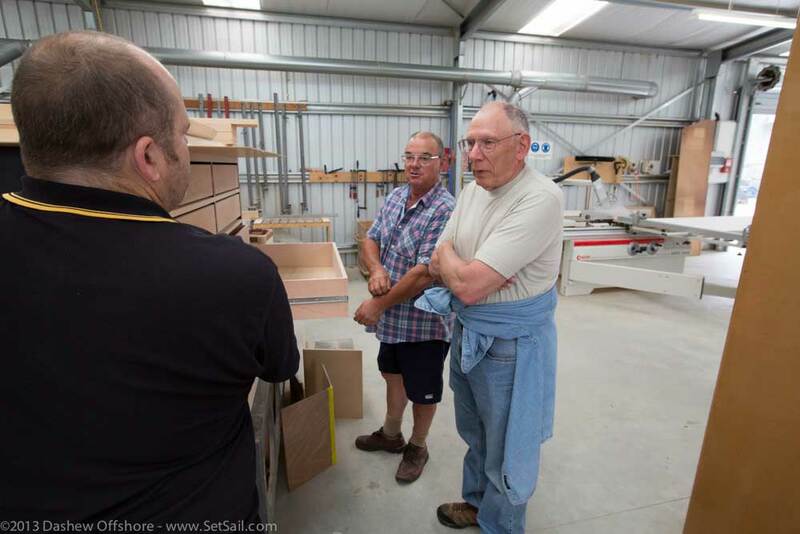 Brendan, in the foreground, runs the carpentry shop. He is discussing fridge drawer details with us. 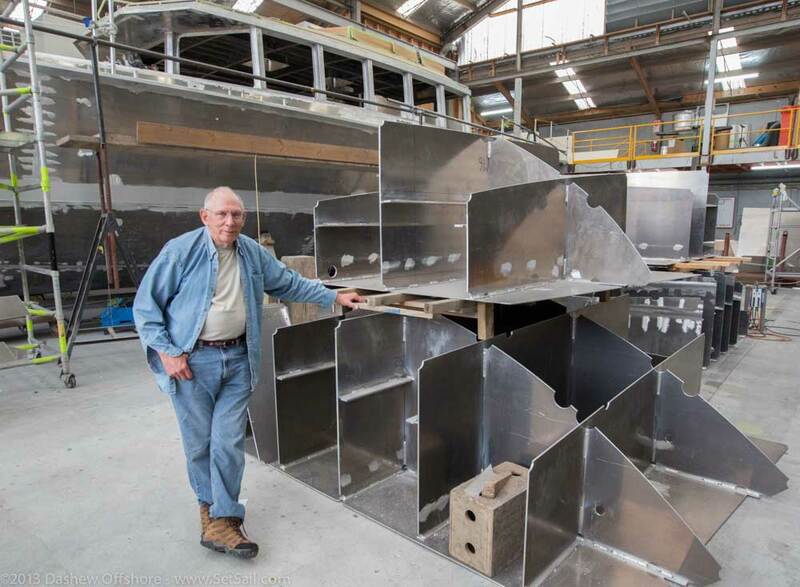 Peter Watson is pointing at the first batch of the plate for his FPB 78. Imagine that, two FPB 78s being built in sequence. 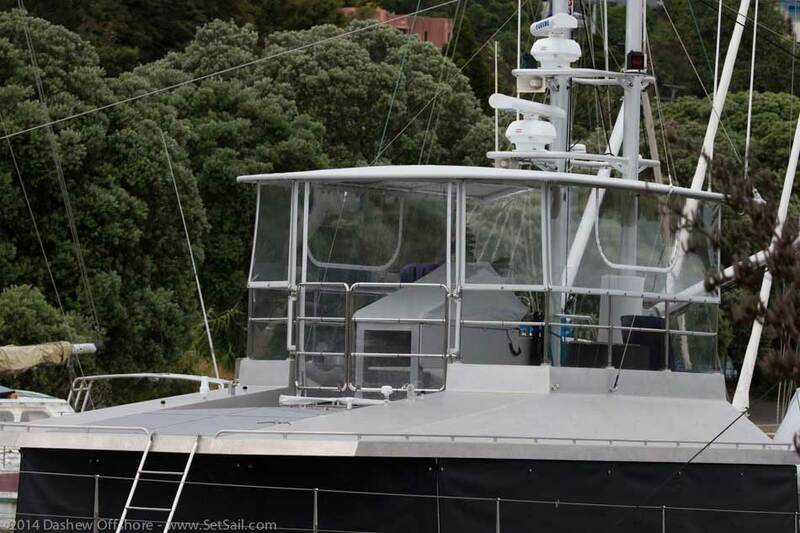 Stedem Wood is in Whangarei getting familiar with FPB 64-8. We had an interesting afternoon playing at very close quarters maneuvering in shallow water: rotating, kissing pilings, and getting off a mud bank. All accomplished with Stedem’s adept touch on the helm and no thruster. FPB 64-5 Tiger is in town as well. 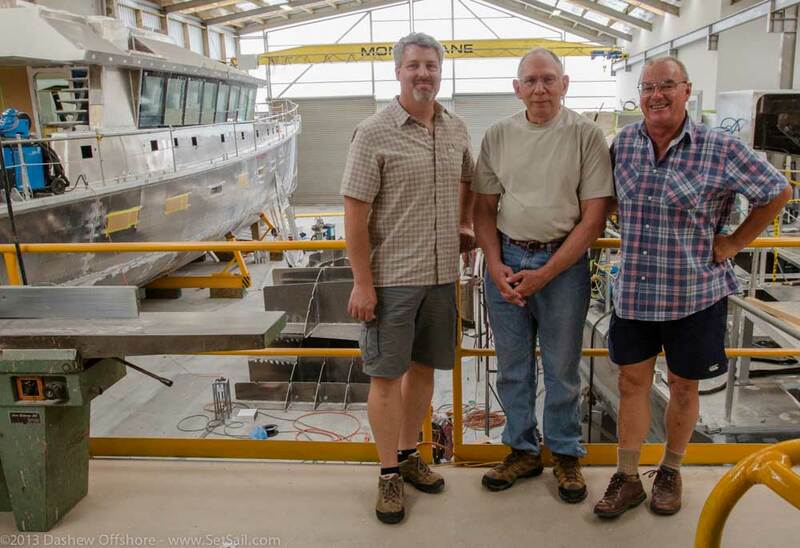 John and Sandy Henrichs are doing a few projects, prior to their next season of cruising. It is always a pleasure chatting with the Henrichs and getting their ideas for improving the FPB breed. We will close with this shot of FPB 64-6, Grey Wolf, at anchor a few miles from her dock. Peter Watson took pity on this writer and offered a ride on a lovely Sunday afternoon. 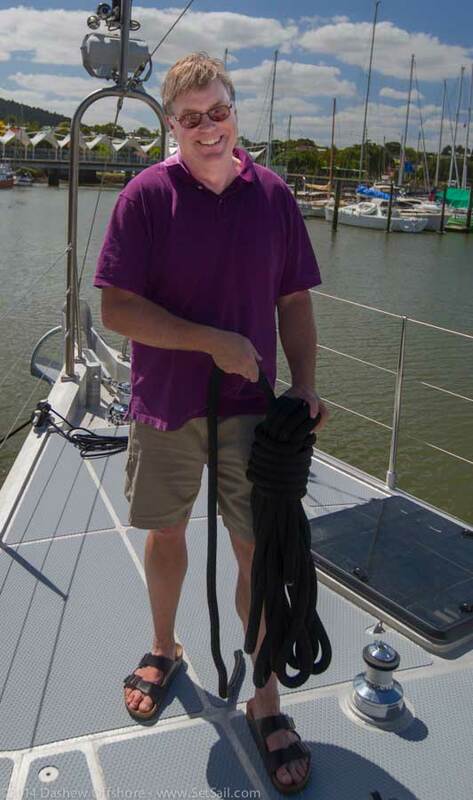 We were able to undock and dock with adverse winds and current, with just two boat widths separating us from the neighbor, and mud flats within a boat length on two sides–without using the thruster of course. As this was one of the first times Peter had maneuvered his FPB 64, it was an impressive display of driving skill. We also had a chance to see if the depth alarm was working (it was) followed by a test of getting off a mud bank under our own power with a falling tide. Finally, Sarah Dashew has a new post up that is a recap of the FPB concept and how it works in the real world, told from the owners’ perspective. You can find it here. This entry was posted on Wednesday, January 22nd, 2014 at 5:51 am and is filed under Dashew Logs, four, FPB Series Notes, The Logs. Both comments and pings are currently closed. Just curious, how many of the products and technologies you have tested over the years on Wind Horse do you intend to incorporate into 78-1? I recall your evaluation of a “searchlight” sonar you seemed really impressed with, or the newer type of AC compressor (sorry I forget the details on that one) which ran much quieter drawing less load than the previous type? I’m sure that over the years you have tested dozens of practical and impractical toys and technologies, just want to know which you feel are the keepers. Tough question, Jono as there have been so many things we have tested. For example, the Furuno searchlight sonar. We really like it, and most of our owners fit it as standard. However, electronics develop quickly and we are looking at possibly trying something different. We are going to give the Manson Supreme anchor a try, use a different type of fridge compressor. Based on what we learned with the small solar array on Wind Horse the new FPB 78s will have ten of the 325 watt solar panels as standard. 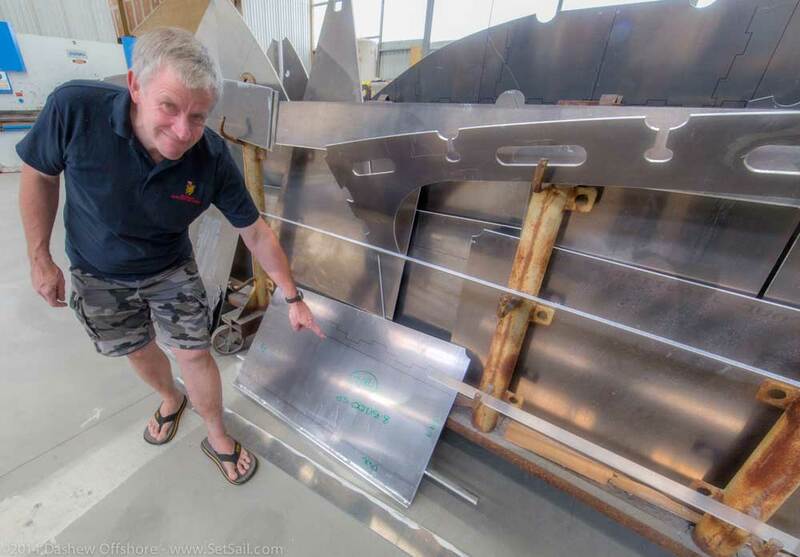 Hi Steve, will the bottom plating be welded directly to those very impressive tank baffles you’re standing next to? I ask because it looks like the tank top is already in place so Circa must have a very small robot welder! Thanks. Yes, the plating is very carefully welded to the framing. And checked with x-rays. Lots of man hours there! The exact sequence is proprietary, as is the weld schedule itself. I was having update withdrawal pains. Looking fwd to a busy 2014 of dream building…. We’ve been behind the bandwidth curve, but getting caught up now. I’m having trouble with my (daily) visits to your website on my ipad. Recently it has become unstable and aborts the page when I try to navigate around after loading. Has something your end changed that May have caused this? I haven’t had any problems with other sites?? Might be the uploading of the bigger photos. ad the roblem orginally and reduced photo quantity. Anyone else having this problem? Yes, last coule of days the home page has caused safari on the ipad to crash pretty frequently. Yes, noticed instability for i-Phone and i-Pad as well. Apologies for the issues with the IOS. With the new front page and the slide whow banneer some IOS devices in band width challenged areas seem to have a problem. We thought we had this put to bed. Guess it is back to the drawing board. It looks beautiful on Android tablets, and that represents more than 60% of tablet shipments. Of course you want SetSail to look good everywhere, but you can already take solace that it looks good in the majority of places.